ieGeek dvd player optimized structure design with a strong anti-vibration and shock resistance, which secure your film viewing pleasure. 1. Want to larger display screen? An AV output lets you connect the DVD player to your TV to watch your favorite movies on a larger screen. 2. Want to connect the two dvd player together? ieGeek dvd player can be connected together to play same movie at the same time. Plugged AV out into a dvd player in DVD mode, and plugged the AV in into the other dvd player in AV mode. Used the latest LCD eye protection screen to reduce flicker and dazzle maximally, better prevent your kids away from near-sightedness. ieGeek portable dvd player support USB & SD Card Memory Playing. If you need to do other things while watching film, enable last-memory function, you can continue to watch it instead of restarting after finishing the work. When you watch a video or listen a song, enable the repeat function, which can play your files on a loop. ieGeek portable dvd player has a "copy" option, you can copy the CD files to their USB or SD cards. 1. The overall product size is 11.5 inch (the outer frame is included). 2. This dvd player supports max 32GB USB and SD cards. 5 Hours Upgraded Battery Capacity➤ ieGeek dvd player, built with a updated 2500mAh rechargeable battery, ensures you can use it about 5 hours. And we also provide an AC power adapter and a 1.9m best quality car charger for your daily life and trip. Sync Screen Playing➤1.AV input and output can be connected to the TV to watch movies on a big screen. 2.Two same players also can be connected together to play same videos at the same time by an AV to AV cable. 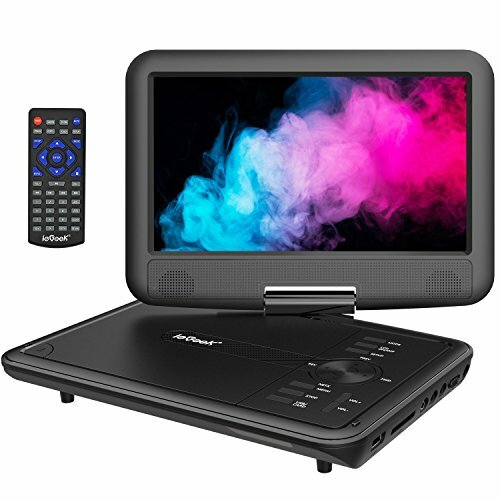 Resume Function➤ ieGeek portable dvd player support USB & SD Card Memory Playing. Enable last-memory function, the player can pick up from where you left last time. Loop Playing➤ This dvd player has a feature for playing a dvd in a loop. When you watch a video or listen a song, enable the repeat function, which can play your files on a loop according to your choice. Supports Multiple Video Formats➤ Region free. This portable dvd player can directly play DVD, DVD+R (-R), DVD+ RW (-RW), CD-R (RW), SVCD (but do not read blu-ray DVD), VCD, EVD, CD, RMVB. And it also can support USB and SD cards playing. And user can copy the CD files to their USB or SD cards via ieGeek portable dvd player.